Tomas Bertok received his BSc. and MSc. degrees in biotechnology at the Slovak University of Technology in 2008 and 2010, respectively. 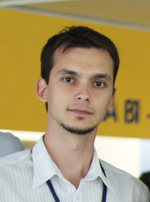 He is currently a Ph.D. student at the Institute of Chemistry, Slovak Academy of Sciences. He is a winner of the Slovak scientific competition for students in the category Chemical and Food Technology – section Biosynthesis and Transformation of Metabolites in the 2009. He is the first author of 6 CC publications and his work currently includes preparation of nanostructured interfaces, protein immobilization and biorecognition, electrochemical and optical biosensors and bioanalytical methods and imaging. Bertok T, Sefcovicova J, Gemeiner P, Tkac J: Lectinomics: A tool in clinical diagnostics (in slovak), Chemicke Listy 106, 20-26, 2012. Bertok T, Sefcovicova J, Gemeiner P, Tkac J: Development and current trends in manufacturing biosensors (in slovak), Chemicke Listy 106, 174-181, 2012. Bertok T, Sediva A, Katrlik J, Gemeiner P, Mikula M, Nosko M, Tkac J: Label-free detection of glycoproteins by the lectin biosensor down to attomolar level using gold nanoparticles, Talanta 108, 11-18, 2013. Bertok T, Gemeiner P, Mikula M, Gemeiner P, Tkac J: Ultrasensitive impedimetric lectin-based biosensor for glycoproteins containing sialic acid, Microchimica Acta 180, 151-159, 2013. Bertok T, Katrlik J, Gemeiner P, Tkac J: Electrochemical lectin based biosensors as a label-free tool in glycomics, Microchimica Acta 180, 1-13, 2013. The project has received funding from the European Research Council under the European Union's Seventh Framework Program (FP/2007-2013)/ERC Grant Agreement no 311532.